When we left off our Luckenbach story, we had talked about how Luckenbach grew from being an Indian trading post to being the most famous little town in Texas. It was the "living room" of Hondo Crouch. He invited his many friends to Luckenbach so he could have them all in a once. The story took us up to September of 1976 when Hondo died suddenly, and his share of Luckenbach passed to his daughters Becky and Chris. The year 1977 was either the best year in the history of Luckenbach or the worst year, depending on your point of view. In April of 1977, the song Luckenbach Texas (Back to the Basics of Love) was released by Waylon Jennings. The song received a lot of attention. It did well on the charts, and it made Luckenbach Texas a household phrase. The song's description of Luckenbach made everyone who heard it want to visit Luckenbach and "get back to the basics of love". They came in droves. The dark side is that a lot of the visitors had little respect for property. They stole everything they could carry off. They even stole the fireplug. They covered the front of the store with graffiti. Even darker was that all the notoriety caught the attention of the State Liquor Board. Up until this time, the only liquor regulation at Luckenbach was "No beer sales before noon on Sundays". People brought their own beer and adult beverages. Beer sales in the bar were to people who didn't bring any beer. When the Liquor Board stepped in, the grounds had to be divided into places where you could buy and sell beer, places you could take your purchased beer and places you could not take your purchased beer. These and a lot of other regulations were put in place. Many of the regular Luckenbach patrons were very upset at not being permitted to bring their own beer onto the grounds. The fences and gates that were installed were known as "Waylon's Wall". A lot of people wanted in on the publicity the song inspired. Soon many small establishments, notably beer joints, were hanging out signs proclaiming they were Luckenbach Texas. Kathy Morgan, who had been the business manager of Luckenbach from the start, was fiercely protective of the trade name "Luckenbach Texas". Any place hanging out a Luckenbach sign promptly got a notice to cease and desist. Under the management of Kathy Morgan and Hondo's two daughters, Luckenbach began to make some sorely needed improvements. The first big improvement was to have a well drilled to provide running water for the place. Up until then, a shallow well with a hand pump was the only source of water on the grounds, other than the creeks. Shortly after the well, came the first real restrooms at Luckenbach. In the old Luckenbach, the ladies were served by three or four wooden outhouses scattered around the grounds. The men used either a tree or the side of the beer barn by Snail Creek. Of course, some Porta-Potties had been brought in for the big events. The next major improvement was to get modern electrical circuits run to the buildings. This improved night vision and greatly reduced the fire risk. In 1990 , the business was incorporated as Luckenbach Texas, Inc. With reliable help in the office, Kathy Morgan began to lessen her day-to-day business management. Several different grounds managers were employed to see to the operations of the post office/general store/beer joint/dance hall. In the early days, Luckenbach was a trashy town. The town's trash, when it was collected at all, was put in a dump just across Snail Creek. When the weather was favorable and the pile big enough, the pile was burned. This left a hill of rusty cans. For trash deposit, several empty 2-Alarm Chili Powder barrels were used. On a busy day, they would overflow before noon. After the Saturday night of a big event in Luckenbach, the immediate area around the store resembled a battlefield. There would be empty beer cans, all sorts of cardboard and paper trash and a few "bodies". 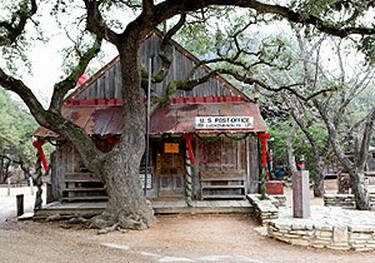 The trashy look of Luckenbach was part of the charm of the place to many of the visitors. Most of the trash pickup that was done, was volunteer labor. For a while there was a Boy Scout troop that came and picked up trash after big events. In early 1974, Tom Nall and Bob Wilson out of Dallas and well-known chiliheads, organized the "Fluck-In" at Luckenbach (Federated Luckenbach Urban Cleanup Kommittee). A large contingent of the chiliheads spent the day with "clean up, paint up, fix up". As it was near Valentine's Day, the chiliheads engaged in a mass hug at the end of the day. Someone suggested that the chiliheads should repeat the gathering the next year. Thus, the "Hug-In" was born. Hug-In continues to be one of Luckenbach's largest, if not the largest event each year. In the Hondo Days, the area between Snail Creek and South Grape Creek behind the town was used as a free camping area for anyone who wanted to camp. The campground contained the old cotton gin and a shed that was packed full of cotton gin parts. The rest of the area was pretty well neglected ground. There were undergrowths and dead trees. For years the campers had free firewood just for the taking or chopping. Luckenbach Texas, Inc. cleaned up the campground so it's a nice place to visit. These days, though, camping there is permitted only for the Hug-In. The Egg House, which now serves as the office for Luckenbach Texas, Inc., is where the egg business that was once a mainstay of the Luckenbach economy was housed. The flood of July 2002 took away the remains of the cotton gin and the shed. All that remains are the massive engine and boiler from the gin. Luckenbach acquired some property west of the dance hall for a large parking lot. It makes crowd control at large events much easier. The dance hall at Luckenbach has provided entertainment for thousands through the years. Kathy Morgan was very protective of the dance hall. It was not open to the public all the time, but only for dances and the occasional concerts. For years, the dance hall was kept in the condition it was in when Hondo and Kathy bought it. There was a jukebox and the original benches that served for seating around the floor. That was about it. Now the dance hall has some modern conveniences such as heat on the cold nights. It has been wired to provide electricity for the stage and overhead lighting. Picnic-style tables with benches are in place. The original benches are stored in the rafters. The old blacksmith shop, which stood across the street from the dance hall, departed with the 2002 flood. On and off it had been used by various vendors and at least one real blacksmith. The "Egg House", which now serves as the office for Luckenbach Texas, Inc., is where the egg business that was once a mainstay of the Luckenbach economy was housed. It has been kept as original as possible. It does now have an air-conditioner, but it no restroom. The large tin "Beer Barn" was the original storage building for Luckenbach. Now it houses banks of coolers for the beer and room for spare beer in case it is needed. The rock building that is between the beer barn and the restroom now was constructed after Hondo acquired the property. The wooden water trough in front of the building is a piece of original Luckenbach furniture. Country music and Luckenbach have been synonymous since Hondo bought the town. When Country morphed into Outlaw Country, that became the main venue. "The song" by Waylon Jennings has a line about "Waylon, Willie and the boys", that makes it sound like Willie Nelson was and is a fixture at Luckenbach. It is told that Willie Nelson was in attendance for the Great Luckenbach World Fair in 1973 . He may have been, but it has not been documented. Willie made his first known appearance in Luckenbach in the mid-seventies, when he came down one quiet afternoon representing Willie's Pool Hall in Austin to challenge the Luckenbach Domino team for domino bragging rights. The Luckenbach team consisted of Armand Engel, one of the original Engel family and another old-timer whose name is forgotten. Willie came with a partner remembered only as Zeke. Willie left knowing that he had a much better chance of a career in Outlaw Country than he had as potential domino hustler. Jerry Jeff Walker and Gary P. Nunn were the first "name" stars to start just hanging out at Luckenbach. In 1995 , Luckenbach and Willie Nelson teamed up to produce Willie's Annual Fourth of July Picnic. It was fairly successful with about thirteen-thousand fans in attendance. In 1996 , Willie persuaded Waylon Jennings to make his first and only appearance at Luckenbach Texas. Willie's picnics at Luckenbach continued through 1999 . Average attendance for the picnics was around twelve-thousand fans. Name stars that appeared at the Willie Picnics included: Robert Earl Keen, Dwight Yoakam, Joe Ely, Larry Gatlin and Emmylou Harris. An uncounted number of lesser stars filled in the spaces. Robert Earl Keen, Dwight Yoakam, Joe Ely, Larry Gatlin and Emmylou Harris have all appeared at Willie's picnics. The guitar is the official musical instrument of Luckenbach. In August of 2009, 1,857 guitar players participated in the song "Luckenbach Texas" to get Luckenbach listed in the Guinness Book of World Records for "The most guitars played simultaneously" location. Today there is live country music at Luckenbach every day. On week days at the crack of one in the afternoon, Jimmy Lee Jones unloads his guitar and plays for tips until four. Willie Nelson has said that Jimmy Lee is one of the great undiscovered talents in Texas, and he is. After Jimmy Lee finishes, another local musician will start the Picker's Circle, a jam session featuring the picker and anyone who wants to sit in. Some really good music comes out of these sessions. Weekends are devoted to hired talent. The Saturday night dances happen mostly on Friday nights now. A list of coming events can be found on Luckenbach's web site. Many of the people who were regular attendees at the early Luckenbach functions are greatly disturbed that Luckenbach has changed. They don't like the idea of having to park in the parking lot. They really don't like the cover charge that is in place for some of the big events and the weekly dances. They are most upset that the price of beer has gone up, and they can't bring in their own beer. One evening Gary P. Nunn was playing a dance in the dance hall. There were seventy-five or so people who had paid to get in the dance hall. There were about two-hundred hanging in the windows listening to the music for free. As Gary P. was getting paid by what came in the door, it was just not fair to him and his band to work for a fraction of what he should have been getting. Therefore, the cover charge to help the band turn a profit, or at least make expenses. Luckenbach still provides a lot of free entertainment. It depends on sales of beer and merchandise to pay the bills. Compared to other places, nothing is overpriced there. The naysayers fail to realize that Luckenbach Texas, Inc is a business. As a business, it must make money to remain open. If Luckenbach had gone out of the Crouch family when Hondo died, there would be no Luckenbach, Texas today.